It's been more than 1.5 year since I started playing. I wait for the daily reset every single day before I go sleep. Addicting but doesn't steal your time. Excellent game with lots to do. If you are looking for a game which rewards your time and commitment as you grow then this is among the best there is. The owner and community are very supportive and are responsive to questions and suggestions from players. So I have been playing this game for almost a year now and it is still my favorite. I really can't nail it down to any one thing that makes me love this game so much. It is simple and does not take much time yet I find myself looking forward to the next chance to play. Lots of skills to work on and objectives to strive for. I have tried to find something like it to tide me over for the time between the daily resets and it has just mastered the niche completely. The community is very active and the events are fun. The coders did add the necessary security to protect the passwords of all the players. The passwords are always encrypted. Only when you register, the password is send to you in the mail for your account activation. It's a good game, but one thing I did disliked about it was that the password is in text and not secured through the script, coders should at least add sha-1 or md5 security to their password script part. After signing up and getting the username and password in my email,it made me not want to be bothered playing the game, it's a security risk. A game where you can do as many things as you can expect from a Medieval time period game and more. From Blacksmithing to Cheesemaking, from Hunting to Beer Brewing, there's way too many skills than any single player can master, only a handful of skills have been mastered at all! Best part is, the game has new features constantly added by the site owner, who plays it himself. No premium access here, everything is available to all! Live in either Camaar or Spero, and leave your mark on the Grail Realm. This game offers people the possibility to get involved in something. It's nice to know that your opinion matters and that you can see your own idea used to improve something. The owner is very opened, it's easy to communicate with him. The Grail Lords is a game full of surprises. I strongly recommend it! One of the better rpg games out there. It has a little different way of doing things that makes it a very good game. A very casual MMO with a long-term, gratifying RPG experience. Skill gains cover a very large array of abilities, and the economy is very player driven. 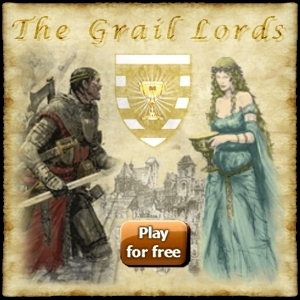 The Grail Lords has a very helpful community base, and the owner/operator of the site is very active within the community. It has a fairly steep learning curve, but once you get your bearings and set yourself goals, it is rewarding. If you want a casual MMO that takes only a few minutes of your time each day, consider TGL.